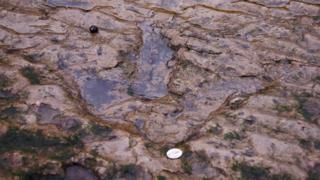 Police have launched an investigation after plaster was poured into two dinosaur footprints on a Skye beach. Officers believe a man driving a campervan may be responsible for damaging the prints at Staffin on Wednesday. Palaeontologists estimate the prints at An Corran date back 165 million years. In a series of tweets, local police officers appealed for help from people who were in the area. Lochaber and Skye police said: "Unfortunately we can confirm we are investigating reported damage to the dinosaur footprints at Staffin yesterday. Were you in the area? "It would appear a male driving a campervan was possibly responsible for pouring plaster into two of the prints. Any info please call 101." The prints at Staffin are believed to have been left by a family Ornithopods, herbivorous creatures which walked on two legs.